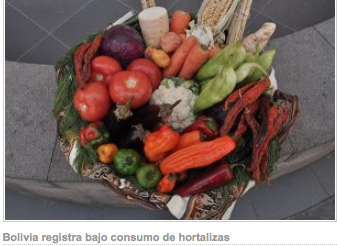 Every Bolivian consumes an average of 150 grams (g) of vegetables, when should eat about 400 grams to maintain their health, according to Juan Jose Estrada, coordinator of the National Vegetable Program, from the Rural Development Ministry. “Our consumption is low. Bolivia is one of the countries that consume fewer vegetables. In average we have 150 grams a day, when recommended is 400 grams,” he said. Estrada said the information that people have about the benefits of vegetables determines the amount of consumption. “Those who consume little are the popular sectors, for example, those with more information about the nutritional properties consume more,” said the official. He said the National Vegetable Program has a budget of 10 million to boost planting for two years and in its task, for example, managed to increase production to 19,000 tons of tomato. However, the president of the College of Agricultural Engineers of Bolivia, Victor Ralde said the tomato shortage is 40,000 to 20,000 tonnes for onion, per year. This entry was posted in Bolivia, Business, Economics, Health and tagged agriculture, food security, food supply, public policy failures. Bookmark the permalink.